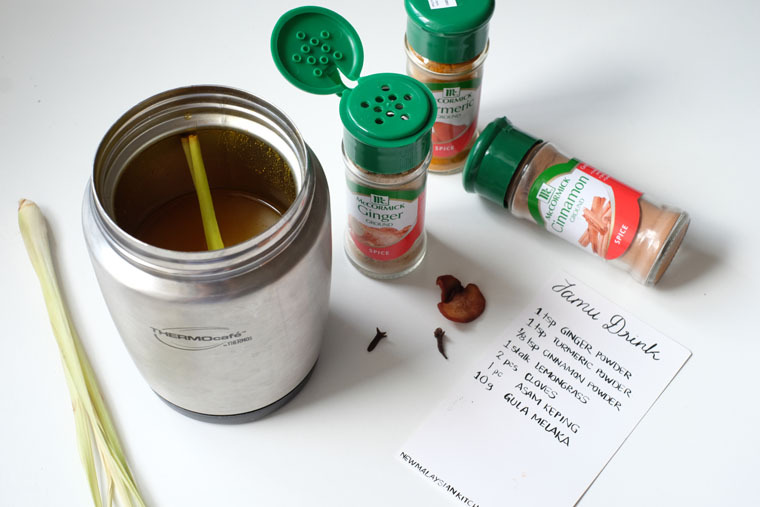 I created this super easy recipe while playing with McCormick herbs and spices. I was invited by The Malaysian Women’s Weekly and McCormick to give a talk about the health benefit of herbs and spices, their convenience and how to use them. 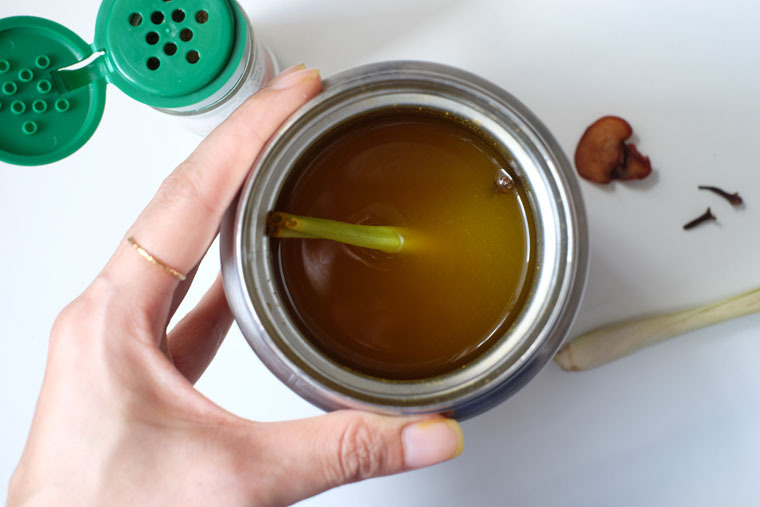 So I simplified one of my favourite recipe Jamu Drink For Health & Beauty. Instead of peeling ginger and turmeric (the latter cause my fingernails to turn yellow), I use blended spices from a bottle. Instead of boiling the tonic for three hours, I add spices and hot water in a thermos flask and let it sit overnight for the flavour to meld. Ta-da! 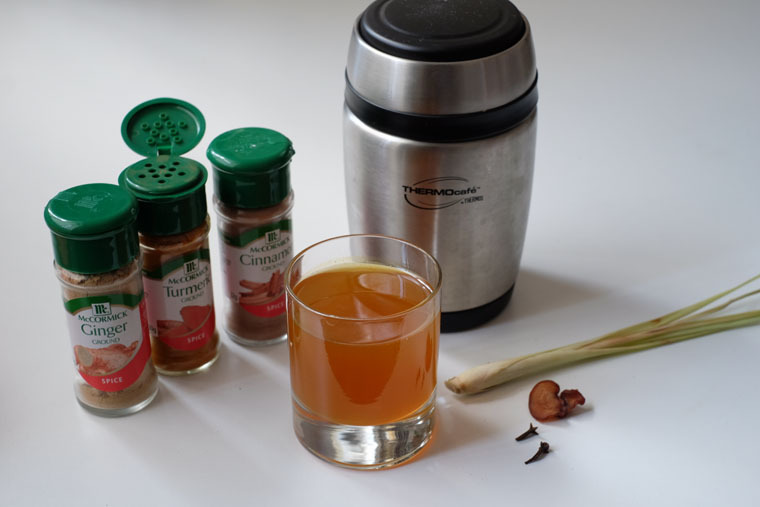 That two tricks allowed me to have a cup of jamu tonic using only 5 minutes of my time! This herbal tonic taste pleasant with a tinge of sour from asam keping, and sweetness from gula melaka (palm sugar) to balance the otherwise bitter taste of spices. In Indonesia, it was served at breakfast – a healthy way to start the day! Step 1 PREP: Gather all materials. Boil 1 cup of water. Slice off the top of the lemongrass and leave only the bottom stalk (about 8 cm), peel off any dried-out layers and smash the end with a rolling pin/ pestle. Step 2 MIX: Add all the ingredients into the thermos flask. Close the flask, shake well, and leave overnight. Add 1 stalk of crushed lemongrass + 1 tsp ginger powder + 1 tsp turmeric powder + 1/8 tsp cinnamon powder + 2 cloves + 10 g gula melaka + 1 cup hot water in a thermos flask. Shake well & leave overnight. Leave for a few hours if you’re pressed for time You don’t have to leave the tonic overnight; a few hours is possible. However, leaving it longer would let the flavour to strengthen. Adjust the taste according to your liking. I like my drink a bit more sourish so I’ll put more asam keping. If you like it to be sweeter, add more gula melaka. You can omit the sugar entirely if you don’t mint the herbal and somewhat bitter taste of the spices. Sweetened with honey Instead of gula melaka, you can sweetened this drink with honey instead. Enjoy your 5 minutes Jamu tonic!